Europeans love serving various home-made sauces with their meats and potatoes. Even though pasta and rice often accompanies meat dishes, potatoes are most popular. 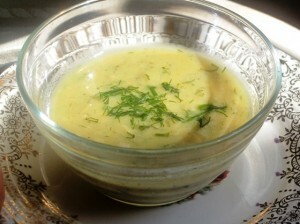 One of those sauces widely used in Eastern Europe, is a Fresh Dill Cream Sauce, which pairs great with Varenyky, Meatless Holubtsy, Palushky, Kendle, Vegetarian Burgers, etc. This sauce is mostly prepared during the summer months, while fresh Dill is readily available, but frozen dill is just as suitable (fresh dill freezes very well, and can last until a new crop is available in late spring). This recipe yields 1 – 1.5 cups of sauce. Heat oil in a medium saucepan, add onions, and saute 2 minutes. Stirring frequently. Mix in flour, stir well to incorporate, and cook for 1 minute. Slowly add in broth, mixing continuously, to create creamy mixture. If sauce is too thick, add little bit more broth, or water. Temper sour cream with little bit of the warm sauce, then add the mixture to the dill sauce. Serve hot, over your favorite dish. Keep it refrigerated for later use, at which time you might have to thin it out a bit, by adding more broth or water. Dill Cream Sauce pairs well with meatless cabbage rolls (Holubtsi), Potato Varenyky, Halushky (Gnocchi), Veggie Burgers, Spinach Turkey Meatballs, Mashed potatoes, etc.